Ive been wanting to visit Mt. Rainier for a number of years. When the snow melts around the dormant volcano, wildflowers pop up everywhere. Fields and fields and fields of wildflowers, so much that it often just looks like sheets of color. The wildflowers bloom in August every year, but some years have more flowers than others and its all dependent upon how much snow the area gets and when it melts. The winter was a nice wet one, and Willie and I had high hopes that the wildflowers would be out in full force. Unfortunately Mama Nature had different plans. The endless fields of flowers we wanted just werent there. We found a patch of flowers here and a patch of flowers there. This particular patch was one such example and in this little area we saw mostly Indian Paintbrush and Purple Lupine. We hiked up the mountain early one morning, knowing that clear skies meant our only chance at a nice photo would happen at twilight, before the sun came up and while it was still blue hour. 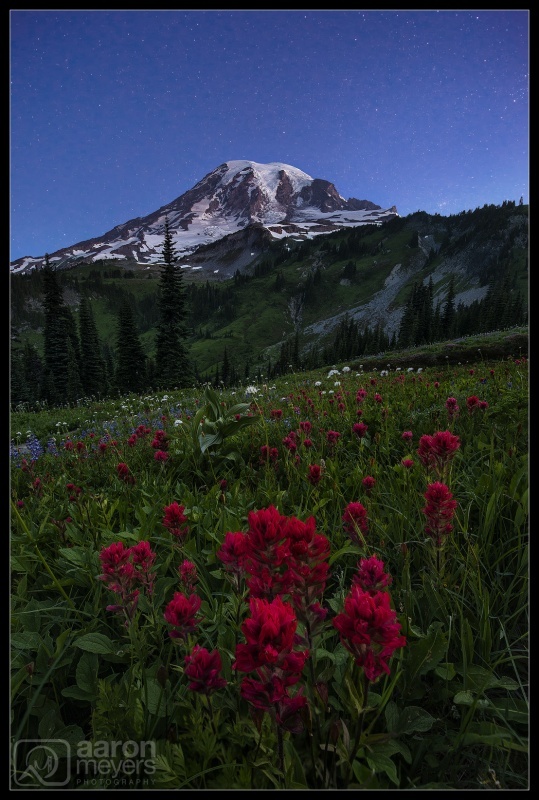 We went to our trusty Paintbrush Field as we called it, and used the beautiful red flowers as the foreground, while the massive Mt. Rainier towers behind.